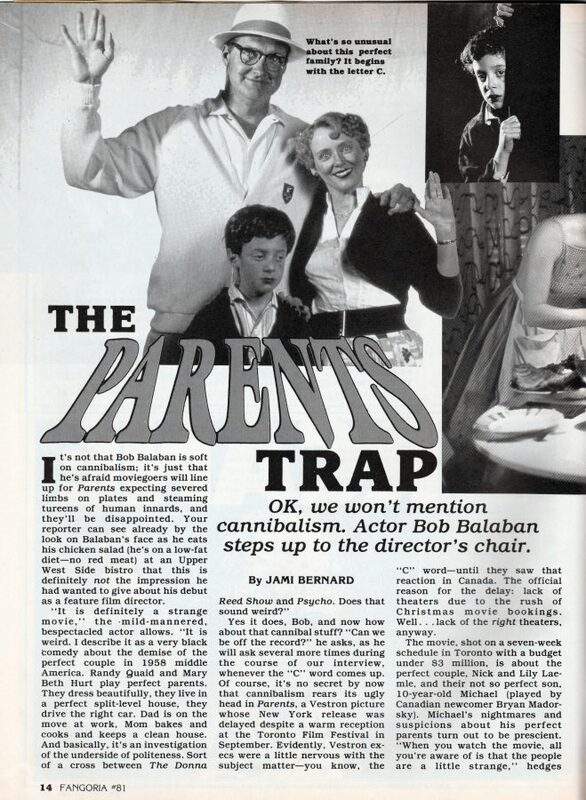 I’m not a fan of cannibal movies, never have been, so when I came across Parents in Fangoria #81, I may have read the article, but I never had any desire to see it, despite the fact it was a black comedy. I’ve heard in the intervening decades it’s become a cult classic, and as the decades flew by, I have now become open to seeing why it’s become one. Plus, I’m a fan of Randy Quaid and he’s great at playing “quirky” characters. So, I finally saw this last night and it’s actually a pretty good movie, and one of the creepiest flicks I’ve ever seen. Aside from the kid’s guidance counselor/case worker, Millie Dew (Sandy Dennis), and his teacher, everyone in this flick plays his or her role as intensely creepy as humanly possible. When I mean everyone, I’m referring to the family members, even the damn kid, who’s the sympathetic lead. Yes, even he’s pretty damn creepy. It takes place in the 60s and is told primarily from the kid’s point of view, minus a few select scenes that focus on the adults. 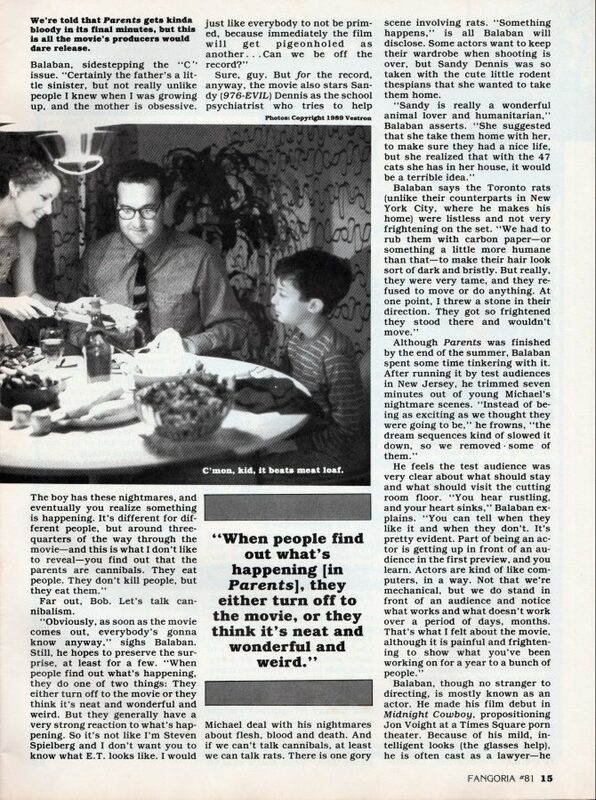 The kid, Michael (Bryan Madorsky), and his parents, Nick (Randy Quaid) and Lily Laemie (Mary Beth Hurt) start off the movie by coming to their new town to live. Lily is a stay-at-home mother, while Nick works as a chemist for a company called, Toxico. Mike’s first day in school has him meeting this girl, Sheila Zellner (Juno Mills-Cockell), who ends up causing him big trouble later on in the movie, by rushing into his house and playfully vandalizing it, to which Nick catches him and reads him the riot act in the creepiest way possible, which happens a lot in this flick. You see Nick and Mike don’t get along. Nick doesn’t like him because he’s a hundred and eighty degrees from who he is, and Nick doesn’t like his father because he thinks he and his mother are eating people, which they are. Big time. Nick refuses to eat supper, lunch too, now that I think about it, and is basically a vegetarian. 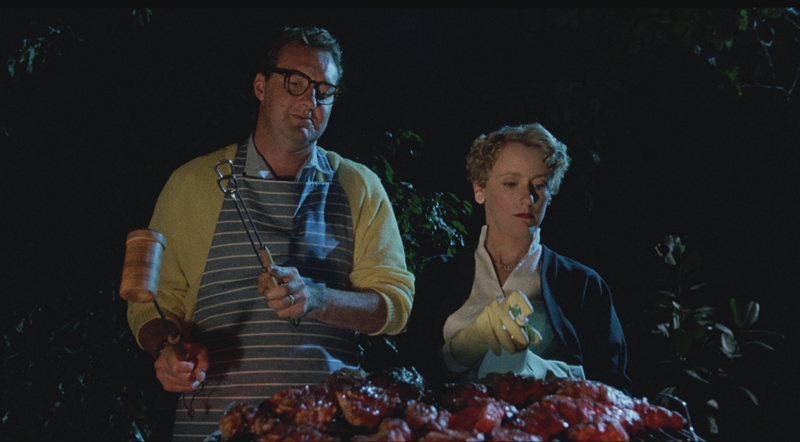 Nick’s job throughout the movie it seems is to menace the kid psychologically and try and get hm to eat the “meat” they cook. His mother is more tolerant of him, but both of them put in one hell of a tour de force of ghoulish menace when they’re all at the dinner table together. Nick acquires their “meat” from work. There’s a morgue at Toxico where they use dead bodies to routinely test their chemicals on, so sneaking in and cutting off some pieces to bring home and fry up is no problem at all. The film builds its menace perfectly, because you just know no flick like this is going to come to a peaceful and cathartic resolution for anyone involved, especially not for Mike. When the physical violence erupts, and it does at the every end, it was actually quite shocking. And it all begins with the discovery of a leg hanging on a meat hook in the basement, and then accelerates the following day when Millie for unknown reasons suddenly decides to follow Mike into his house after she drives him and he bolts for the front door. Mille discovers a body in the basement, but it’s already too late. Nick and Lily have already come home and even the murder of Millie is portrayed with supreme amounts of creep as only the gloved hands of the murderer are seen, making you wonder is it Lily or Nick doing the killing? They both are! 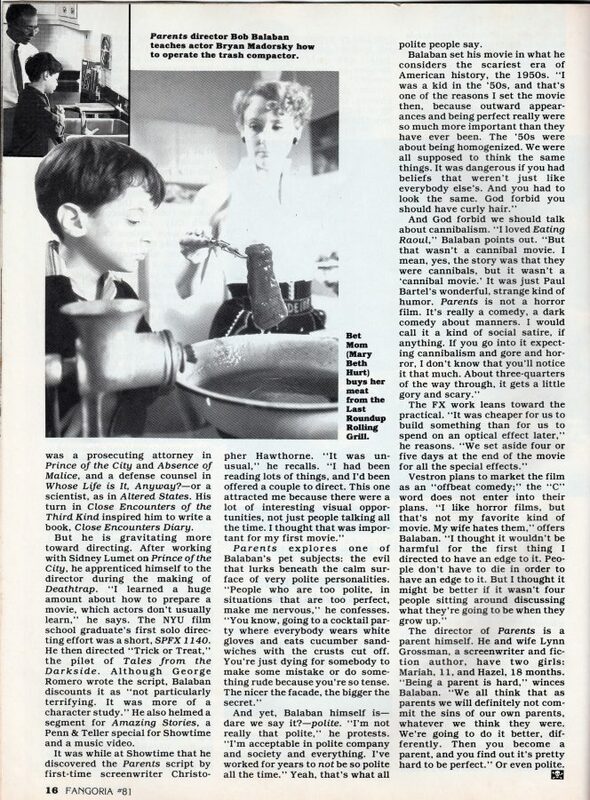 Full article from Fangoria #81. Click photos to enlarge and read. I don’t want to go too far into describing the final moments of the movie since that’s where it’s all been building towards and if you haven’t ever seen it Parents is best experienced cold and ignorant. Shiver. There is gore in this movie, but not to the level you would expect for a movie about people eating people. It’s restrained and seen mostly in dreams Mike has, a memory he has and the aforementioned leg hanging on a hook. I liked this flick because of Quaid’s performance and how amped up the creep (God, I’m getting sick of using this word, where’s my Thesaurus?) level was at everv turn. This is another flick Pioneer Studios put out on DVD back in 1999. Lair Of The White Worm was another. It was full frame though. Then Lionsgate released it in a double feature with Fear (1990) in 2006. This time it did get widescreened. Coming this January 31st Lionsgate finally gives it the blu-ray treatment it deserves through their new Vestron Video Collector’s Series banner! Buy it here on Amazon! Video/Audio/Subtitles: 1080p 1.85:1 high definition widescreen—2.0 English DTS-HD Master Audio—English SDH subs only. 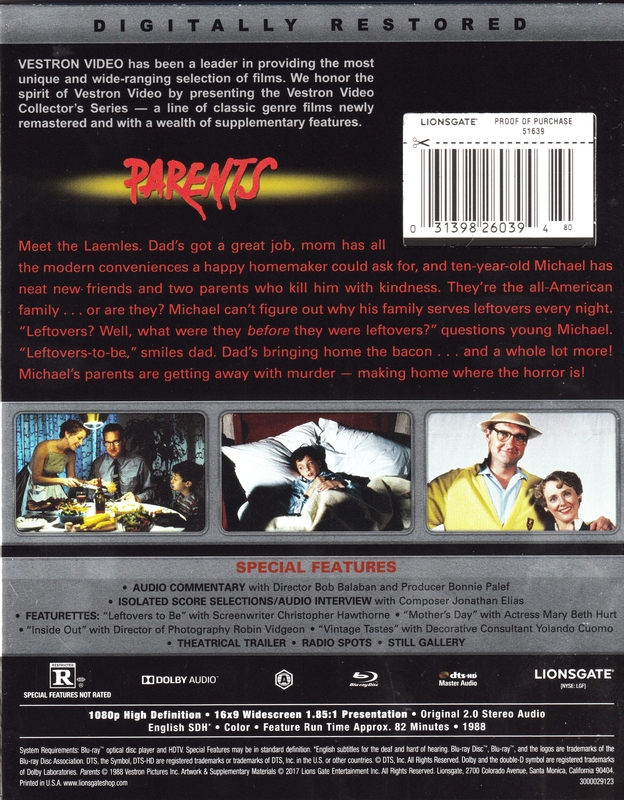 Gallery | This entry was posted in VESTRON VIDEO COLLECTOR'S SERIES: Parents (1989) Blu-ray. Bookmark the permalink.